Hatters boss Nathan Jones isn’t preparing to face a tired Gillingham at Priestfield this afternoon. The Gills were taken to extra time by non-league Hartlepool in the FA Cup on Wednesday evening, eventually progressing 4-3 after 120 minutes of football. Boss Steve Lovell admitted they were ‘out on their feet’ afterwards, but Jones wasn’t taking that into consideration, saying: “I have no idea how much they exerted themselves, or how they recover, or what individuals’ fitness levels are. “All I can do is prepare my team. We’re in good form and we want to continue that form, so if, inadvertently we’re looking back at five to five on Saturday and Gillingham have been tired and we’ve benefited from that, all well and good. On target for the Gills at Victoria Park was striker Tom Eaves, who netted his 12th of the campaign already. 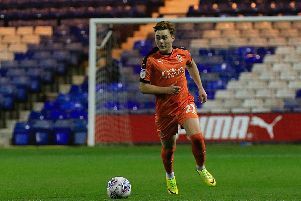 His form in front of goal was of no major concern to Jones though, the Luton chief adding: “I wouldn’t say especially. (Freddie) Ladapo at the weekend was in fantastic form, Graham Carey, (Joel) Grant, so we come up against these types of players. “It’s about us, what we do, we’re in good form, we’re in a good place team-wise, so we have to concentrate on ourselves.